Based on Robert Louis Stevenson’s Treasure Island, the classic tale of pirates, treachery and adventure. Expect audience participation, mayhem and mirth as The Company of Actors romp their whacky way towards Captain Flint’s buried treasure. 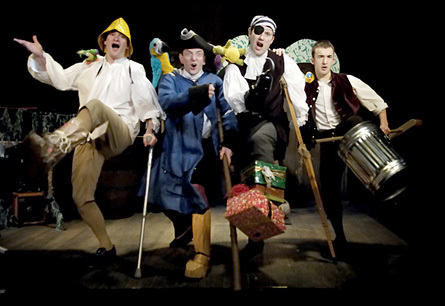 ‘Treasure Island is entertaining and utterly compelling from the moment the five performers burst into the theatre; filling every area of the traverse stage, and every moment of the story with energy and whit. A new adaptation of Stevenson’s adventure book, the play follows the story of Jim, a young boy who is fascinated and haunted by the stories an old Captain tells in his Parents Inn. Jim is given a secret treasure map which he defends from the extremely scary Blind Pugh, played to perfection in hooded cape by Asa Joel. After Jim, played by a very charismatic and likeable David Levine, is forced to kill for the first time, he informs his Mother with the words of a queen song before heading off as cabin boy on a ship bound for the Treasure Island. The four actors (Joel, Levine, Rafe Beckley and Richard Stemp) play all the characters, sometimes in very quick succession which proves hilarious if slightly hard work for the audience! They all display great versatility and skill to keep the story moving along whilst swapping costume onstage. There are plenty of styles of humour ranging from Panto to Monty Python to The Mighty Boosh, so there’s something for everyone. The play also messes with theatrical convention by the actors narrating, stepping out of character to discuss costume issues like why the male character ‘Joyce’ is in a red sequinned dress, and then discussing which style of theatre is best to finish the play. This makes the whole experience fun and multi-layered. Everything is underscored by pianist and accordion player Stephen Daltry who is very much part of the action adding comments along the way. The songs, written by Paul Knight, are far superior to the usual musical numbers found in this type of fringe show and have definite echoes of Sondheim, with catchy tunes and witty, touching lyrics, giving depth to the play. The actors attempt some hilarious dance numbers which are sheer comedy including the peg leg tap, with ingenious types of peg legs. The audience was made up of a whole range of ages and everyone loved it. The traverse stage meant having a good view of the younger contingent of audience whose faces showed their total involvement in the story and delight throughout. My face hurt from laughing so much. The play’s only downfall is that the story gets a little lost in the second act and the treasure is never actually discovered, but we were all laughing too much to be particularly bothered.